This data set provides normalized difference vegetation index (NDVI) data for the arctic growing season derived primarily with data from Advanced Very High Resolution Radiometer (AVHRR) sensors onboard several NOAA satellites over the years 1982 through 2012. The NDVI data, which show vegetation activity, were averaged annually for the arctic growing season (GS; June, July and August). The products include the annual GS-NDVI values and the results of a cumulative GS-NDVI time series trends analysis. The data are circumpolar in coverage at 8-km resolution and limited to greater than 20 degrees N.
These normalized difference vegetation index (NDVI) trends were calculated using the third generation data set from the Global Inventory Modeling and Mapping Studies (GIMMS 3g). GIMMS 3g improves on its predecessor (GIMMS g) in three important ways. First, GIMMS 3g integrates data from NOAA-17 and 18 satellites to lengthen its record. Second, it addresses the spatial discontinuity north of 72 degrees N, by using SeaWiFS, in addition to SPOT VGT, to calibrate between the second and third versions of the AVHRR sensor (AVHRR/2 and AVHRR/3). Finally, the GIMMS 3g algorithm incorporates improved snowmelt detection and is calibrated based on data from the shorter, arctic growing season (May-September) rather than the entire year (January-December). The annual GS-NDVI data are provided in a single NetCDF v4 file. The GS-NDVI trends, significance of these trends, and a land cover map (GLC2000) are provided as three GeoTIFF files. Figure 1: NDVI Arctic Growing Season Trends from GIMMS 3g, 1982-2012. We acknowledge support from the NASA Carbon Cycle and Ecosystems program grants NNX08AG13G and NNX09AI24G to S.J. Goetz. 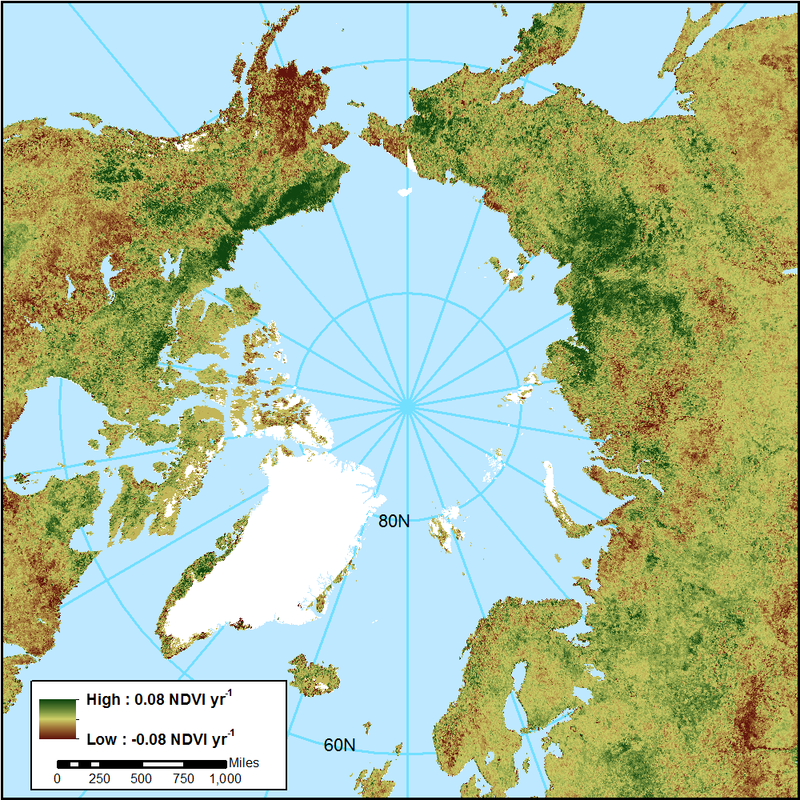 This data set provides normalized difference vegetation index (NDVI) data for the arctic growing season derived primarily with data from the Advanced Very High Resolution Radiometer (AVHRR) aboard several NOAA satellites over the years 1982 through 2012. The NDVI data were averaged annually for the arctic growing season (GS; June, July and August). The products include the annual GS-NDVI values and the results of a cumulative GS-NDVI time series trends analysis. The data are circumpolar in coverage at 8-km resolution and limited to greater than 20 degrees N.
This third generation Global Inventory Modeling and Mapping Studies (GIMMS 3g) product is a ca. 8-km resolution, 15-day maximum value composite (MVC), bimonthly, global NDVI product generated from AVHRR data (NOAA-7, 9, 11, 14, 16-19). GIMMS 3g integrates data from NOAA-17 and -18, to improve the length and quality of the GIMMS-NDVI record and uses SeaWiFS (along with SPOT VGT) data to combine the AVHRR/2 and AVHRR/3 data sets to address the discontinuity north of 72 degrees N, present in GIMMSg (Pinzon et al., 2007; Pinzon and Tucker 2014). The GIMMS 3g algorithm also has improved snow-melt detection and is calibrated based on data from the shorter, arctic growing season (May–September), rather than the entire year (January–December). GS-NDVI time series trends (brownness-greenness) were calculated using the Theil-Sen method (Theil, 1992). Areas defined as cropland, permanent snow and ice or other unnatural vegetation types in the Global Land Cover 2000 map (GLC2000; Table 1) were masked out. The GLC2000 map has been resampled (using the nearest neighbor method) to match the GIMMS 3G 8-km grid and is included in this data set (Guay et al. 2014). Northern hemisphere north of 20 degrees N.
AVHRR source data from 1982-06-01 to 2012-08-31. The annual GS-NDVI data are proved in a single NetCDF v4 file. The GS-NDVI trends, the significance of trends, and the land cover map (GLC2000) are provided in GeoTIFF format. Land cover map (GLC2000) with 23 classes. Guay et al. (2014) masked out land cover classes greater than or equal to 16. Global Land Cover 2000 Map (GLC2000) was resampled to match the GIMMS 3g grid. The following classes were masked in Guay et al. (2014). The data file covers the years of 1982 through 2012 (31 bands) but only the average NDVI of growing season months June, July, and August of each year. An additional time boundary dimension (nv) is included in the data set to account for the seasonal nature of the data. The single netCDF file was created by combining 31 individual annual GS-NDVI GeoTIFFs using Geospatial Data Abstraction Library (GDAL) and netCDF Operator (NCO) software. The NCO software was then utilized to edit the netCDF header to bring it into Climate and Forecast (CF) compliance. The AVHRR-based GIMMS-NDVI version G (GIMMS g) series, and its recent successor version 3g (GIMMS 3g), as well as the shorter NDVI records generated from the more modern sensors, SeaWiFS, SPOT-VGT, and MODIS were compared. The data sets from the latter two sensors were provided in a form that reduces the effects of surface reflectance associated with solar and view angles (Guay et al., 2014). See Pinzon and Tucker (2014) for discussion of specific comparisons between GIMMS 3g and independently measured appropriate climate phenomena needed to improve our understanding of uncertainty the AVHRR GIMMS 3g product. This data set provides normalized difference vegetation index (NDVI) data for the arctic growing season derived primarily with data from Advanced Very High Resolution Radiometer (AVHRR) sensors aboard several NOAA satellites over the years 1982 through 2012. The NDVI data were averaged annually for the arctic growing season (GS; June, July and August). The data are circumpolar in coverage at 8-km resolution and limited to greater than 20 degrees N. Like its predecessor, the third generation Global Inventory Modeling and Mapping Studies (GIMMS 3g) product is a ca. 8-km resolution, 15-day maximum value composite (MVC), bimonthly, global NDVI product generated from AVHRR data (NOAA-7, 9, 11, 14, 16-19). GIMMS 3g integrates data from NOAA-17 and -18, to improve the length and quality of the GIMMS-NDVI record and uses SeaWiFS (along with SPOT VGT) data to combine the AVHRR/2 and AVHRR/3 data sets to address the discontinuity north of 72 degrees N, present in GIMMS g (Pinzon et al., 2007; Pinzon and Tucker 2014). The GIMMS 3g algorithm also has improved snowmelt detection and is calibrated based on data from the shorter, arctic growing season (May–September), rather than the entire year (January–December). As described in Guay et al. (2014), the temporal trends in the GS-NDVI annual time series were estimated using the Theil-Sen approach (Theil, 1992). Trends were not estimated for pixels that were missing data anywhere in the time series. The Mann-Kendall test was used to assess trends for statistical significance (Mann, 1945), regarding pixels as significant when P < 0.05. Compared to a simple linear regression, the Theil-Sen slope estimator is more robust to outliers, as it estimates the slope of a time series as the median of all slopes between pairs of observations in the time series. We explored using this population of slopes to empirically determine 95% confidence intervals around the slope estimate as an alternative assessment of statistical significance. However, the Mann-Kendall test was far more conservative when applied to the common record. Trend analyses were performed using the tools in the zyp package (Bronaugh & Werner, 2012) in R (R Core Team, 2012). Bronaugh D, Werner A (2012) zyp: Zhang + Yue-Pilon Trends Package. R Foundation for Statistical Computing, Vienna. Guay KC, Beck PSA, Berner LT, Goetz SJ, Baccini A, Buermann W (2014) Vegetation productivity patterns at high northern latitudes: a multi-sensor satellite data assessment. Global Change Biology, 20, 3147-3158. Mann HB (1945) Nonparametric tests against trend. Econometrica, 13, 245-259. Pinzon JE, Brown ME, Tucker CJ (2007) Global Inventory Modeling and Mapping Studies (GIMMS) Satellite Drift Corrected and NOAA-16 incorporated Normalized Difference Vegetation Index (NDVI), Monthly 1981-2006. Pinzon JE, Tucker CJ (2014) A Non-Stationary 1981-2012 AVHRR NDVI3g Time Series. Remote Sensing, 6, 6929-6960. R Core Team (2012) R: A Language and Environment for Statistical Computing. R Foundation for Statistical Computing, Vienna, Austria. The Global Land Cover Map for the Year 2000, 2003. GLC2000 database, European Commission Joint Research Centre. http://www-gem.jrc.it/glc2000. Theil H (1992) A rank-invariant method of linear and polynomial regression analysis. In: Econometric Theory and Methodology, Vol. 23 (eds Raj B, Koerts J), pp. 345–381. Springer, Houten, the Netherlands.